Yentafo is a Thai/Chinese noodle dish that takes a lot of time to prepare, but not with this new premade yentafo sauce made in Thailand. 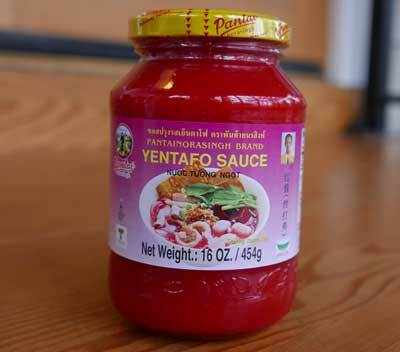 Yentafo has a unique flavor and distinctive red color. See our recipe for yentafo. We are offering Pantainorasingh brand as shown, a superior product with authentic flavor. Packed in a glass jar. Ingredients: water, rice flour, salt, thickener, modified corn starch, acidity regulator (acetic acid), preservative (sodium benzoate), artificial color (FD&C Red No.40).